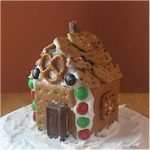 We always think of gingerbread at Christmastime and making a gingerbread house is not always easy. Here is an idea for an Easy Gingerbread A Frame House. 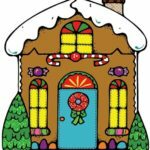 The younger children will love being able to join in the gingerbread activities and everyone can make their own with this idea. 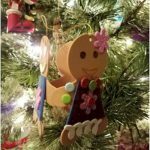 You can make this project easy by buying pre-made gingerbread and frosting or you can whip up a batch of your own. You decide how much time you have to participate without overwhelming your schedule. Holidays should be fun and memorable for everyone. We always have a gingerbread house contest on Christmas Eve at my daughter’s house with some neutral person as the “judge”. The end result is laughable and we often have to recruit a video judge from as far away as California. This is a good craft to get your scout troop in the mood for their next camping trip as the A frame reminds them that camping comes in all types of shelter. The whole point is to have fun. *While we are showing these candies, use your imagination and select the candies that appeal to you and your children. Spread newspaper or a plastic tablecloth over your work surface to save yourself clean up time. Cut 2 rectangular pieces of gingerbread for the roof and 2 shaped like a triangle for the walls of your gingerbread A frame house. Use the vanilla frosting as glue to hold your gingerbread pieces together. It might be smart to let the frosting “glue” set for a few minutes to harden up. Let the kids pick through their favorite candies and put frosting on the back to glue them to the gingerbread structure. You may end up with some unique designs, but the fun is in the making. Remember, coconut makes good snow if they want snow on the roof. Just spread a layer of frosting and sprinkle on the coconut for a winter wonderland effect.